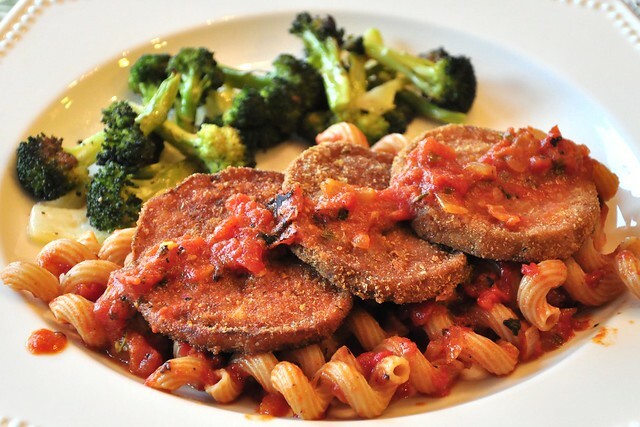 It's the first full week back at high school for the kids, so we're revisiting an old favorite of our daughter's -- Eggplant Parmesan (recipe). Rounding out the plate was broccoli -- tossed with olive oil, salt & pepper and roasted at 450F for 15 minutes. 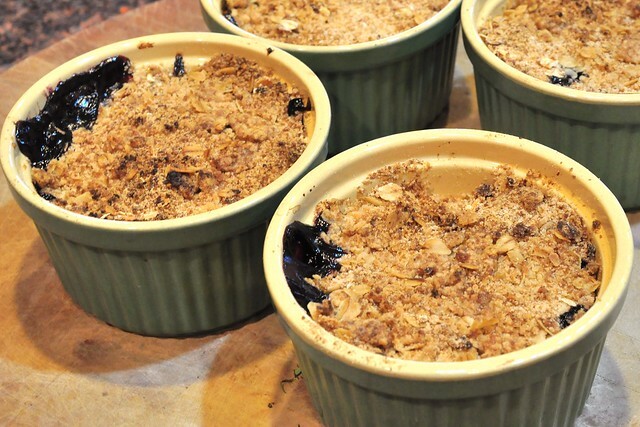 We're knee deep in local peaches (that did not come from a can, nor were they were put there by a man, in a factory downtown*) so we made a quick crumble with the addition of some lovely blueberries -- mixed with a pinch of cardamon and a squeeze of lemon juice. The topping was a 2:1 mix of all-purpose flour and whole wheat pastry flour, along with oatmeal, brown sugar, cinnamon, salt and Earth Balance rounding it out. * I apologize in advance for the earworm. 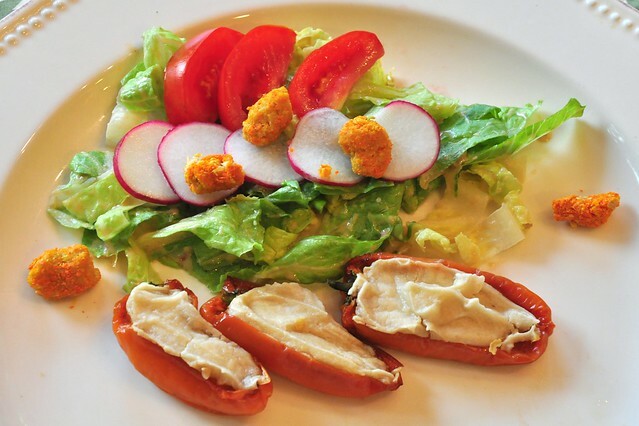 Another in the greatest hits package -- mini-peppers stuffed with a cashew cheese and a salad with carrot croutons. 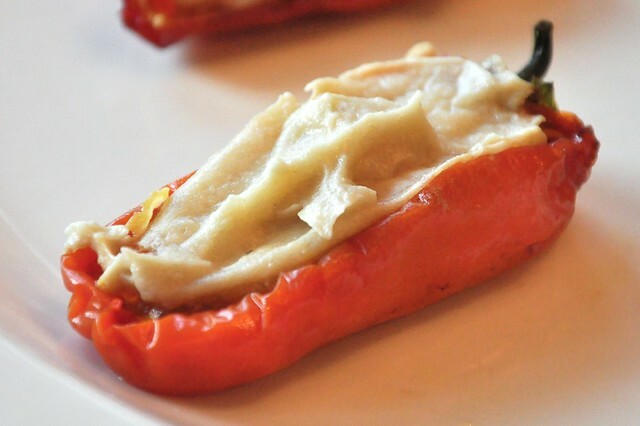 The cashew cheese (soaked cashews, rejuvelac from quinoa, salt) were added to the peppers and dehydrated for 8 hours at 105F, which made the peppers incredibly sweet (almost cherry tomato-like, as our daughter pointed out). 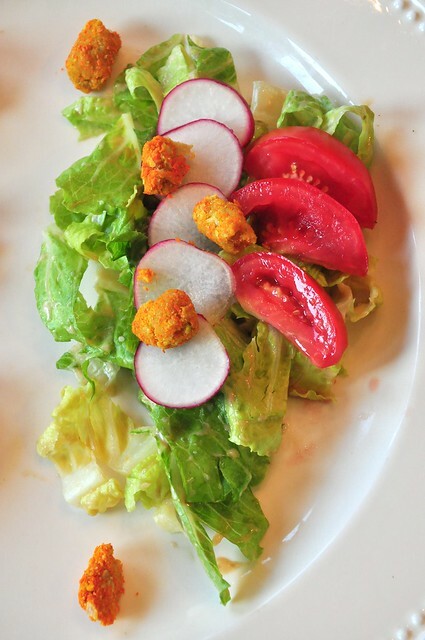 The salad incorporated a riff from the Trotter/Klein "Raw" book -- take a carrot, peel it into strips, dehydrate for a couple of hours and turn it into a powder, which is then used to coat the cashew cheese, and is then further dehydrated. 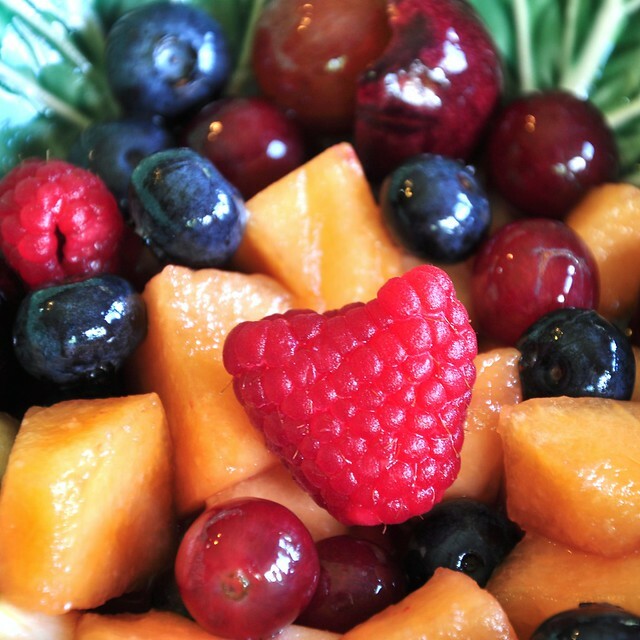 It adds a gentle sweetness and crunch, much like a crouton. We had a couple of zucchini leftover from last weeks farmers market, so we tried something new -- making rellenos with them. 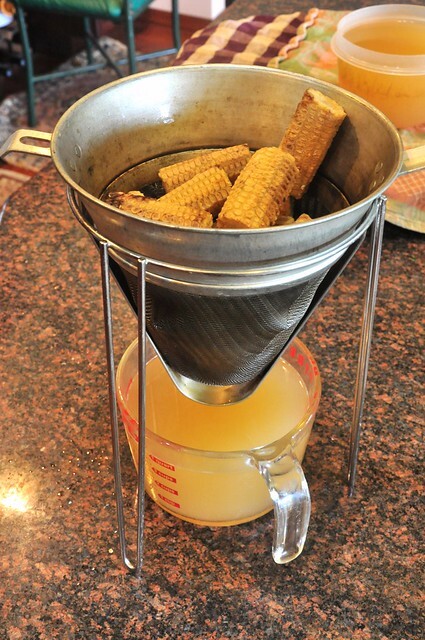 We also made a smoked corn stock as the base for the hominy and potato soup. 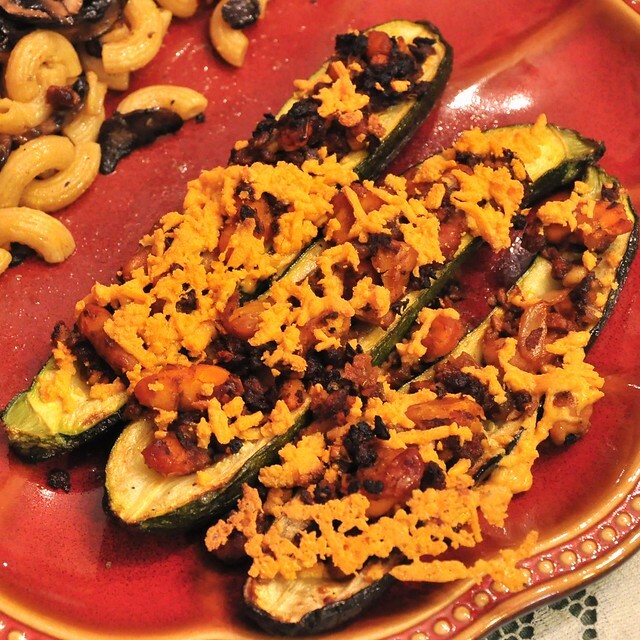 The rellenos started with the zucchini cut in half and smoked for 20 minutes. 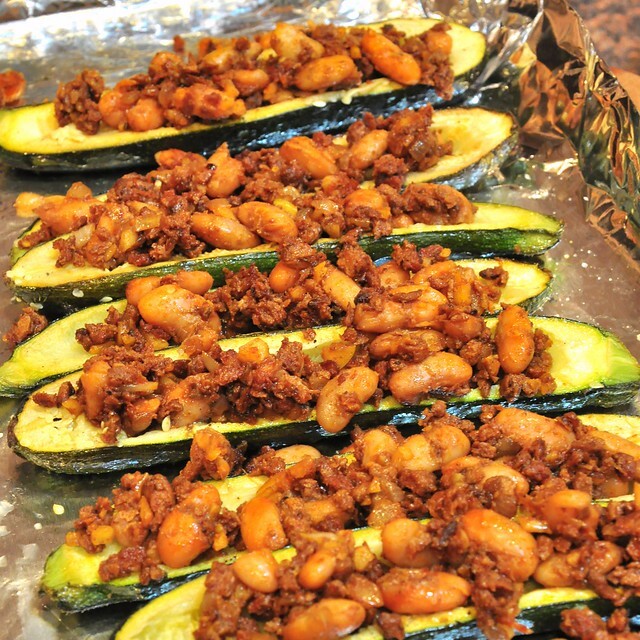 The filling consisted of soy chorizo, smoked walnuts, cannellini beans, onion, garlic, Mexican oregano, salt & pepper. 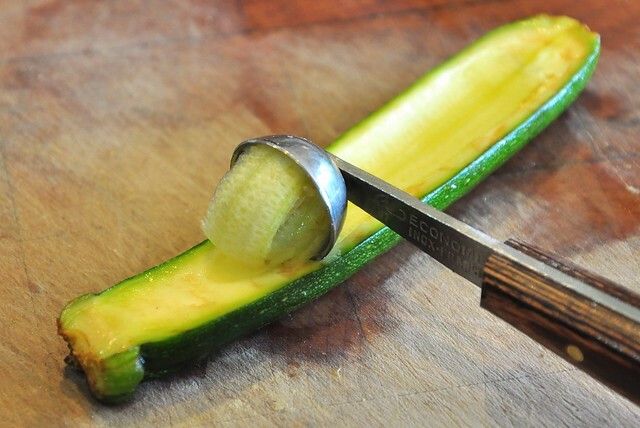 The zucchini were roasted at 425F for 20 minutes, removed from the oven with the seeds removed using a melon baller. 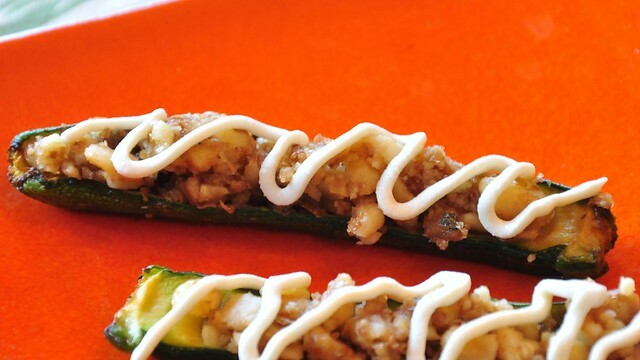 The filling was added, along with a covering of Daiya, then put back into the oven for an additional 15 minutes. 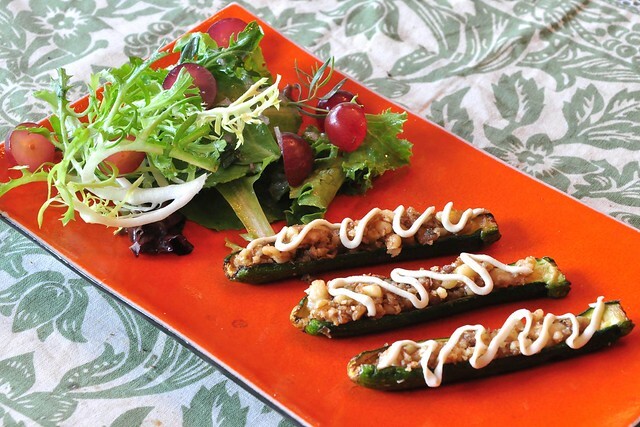 The rellenos came out great -- the roasted zucchini was creamy inside and paired really well with the spicy filling and Daiya. 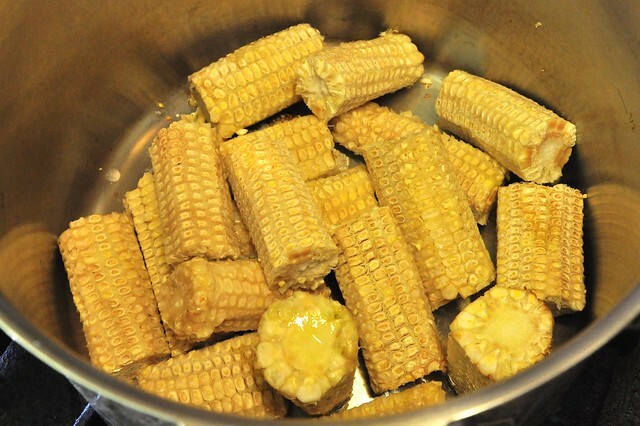 The soup started with smoked corn stock -- we saved the corn cobs from the corn cakes on Wednesday and smoked them with hickory wood for 25 minutes. 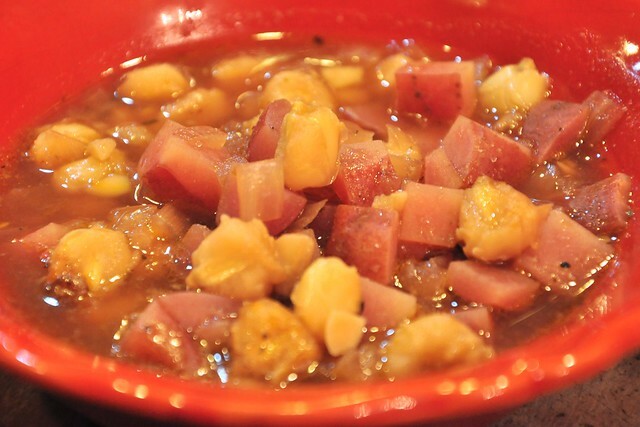 It seemed like a natural to pair it with hominy and those red potatoes from the last week. 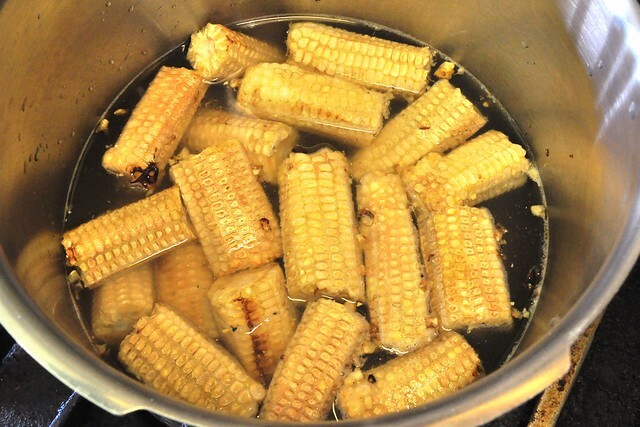 Next, we seared the cobs in the pressure cooker (with 1 tsp. of canola oil) until the got a little color. 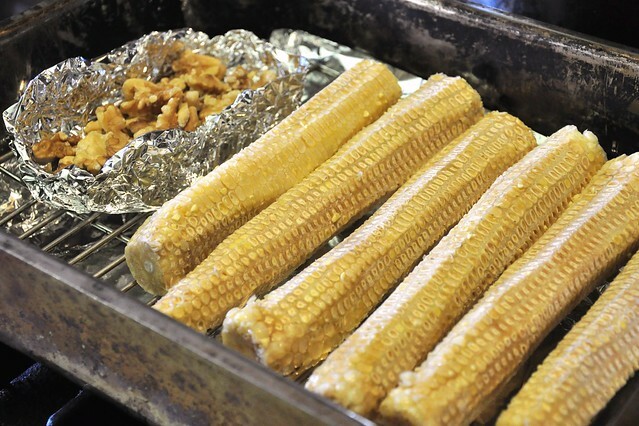 Finally we added 10 cups of water and pressure cooked the cobs for 40 minutes. The result was liquid gold -- and when used in the soup, it yielded a fantastically deep flavor with a nicely balanced sense of hickory and corn. A "greatest hits of summer" meal tonight -- we're overloaded with basil, zucchini & tomatoes, plus additions from the farmers market (corn, wild asparagus). 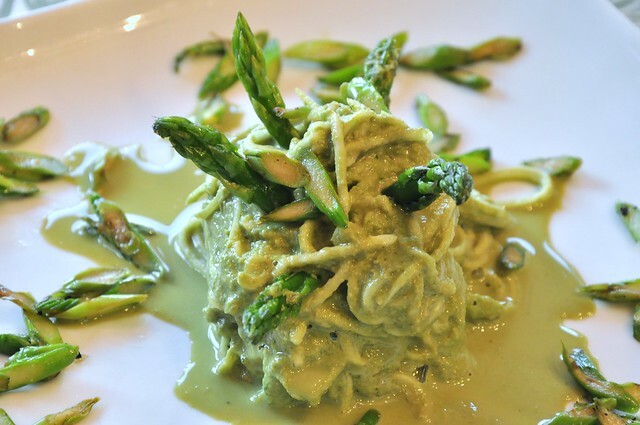 The pesto, as always, rocks -- olive oil, lemon juice, garlic, pine nuts and salt all blended in the vita-mix, served over spiral cut zucchini noodles. 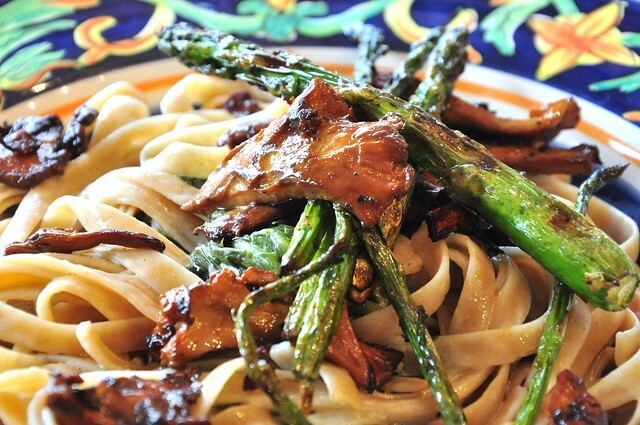 Tonight we served it along with the wild asparagus. The tips were trimmed off and the body sliced very thinly on the bias, tossed with olive oil and nama shoyu and dehydrated for 1 hr at 105F. 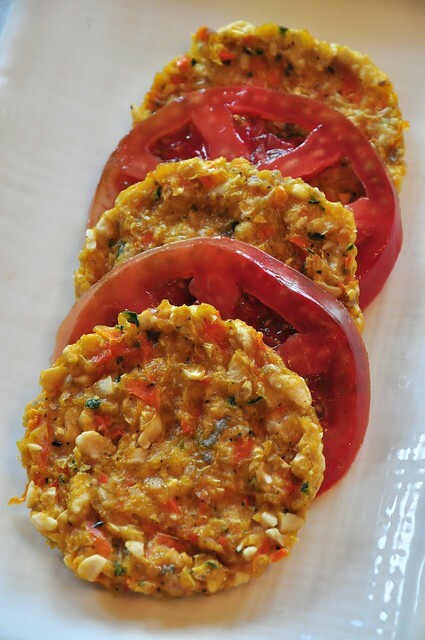 The corn cakes are a perennial favorite (recipe), with the right balance of heat and sweetness, paired with a very ripe heirloom tomato. We started off with a fennel salad, a riff from Juliano's "Raw" cookbook. Corn! Potatoes! Chanterelle Mushrooms! A veritable cornucopia, barely contained by the plate. The tofu was portioned into eight cutlets, smoked with hickory chips for 20-25 minutes, pan-fried in 1 tbs. of olive oil until golden brown (about 5-7 minute per-side) and splashed with 1 tbs. of tamari at the end of cooking. As I mentioned the other day, the chanterelles are foraged locally, so we take the extra time to thoroughly clean the mushrooms, making sure nobody is hiding in there. 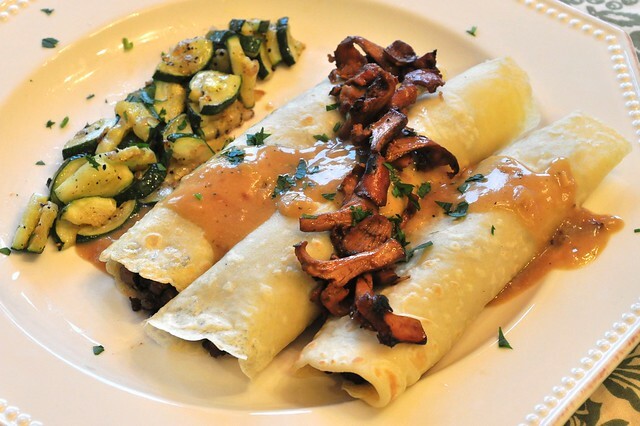 We started with about 2 cups of 1/4" thick sliced mushrooms and pan-fried them with 1 tbs. olive oil on med-high heat until all the water was released, about 8-10 minutes. Near the end of cooking they were splashed with 2 tsp. of tamari and cooked for 1 additional minute. Next, we removed the pan from the heat, added 1 tbs. of cognac, returned the pan to the stove, turned the heat down to low, stirred to coat the mushrooms and cooked for 1 more additional minute. 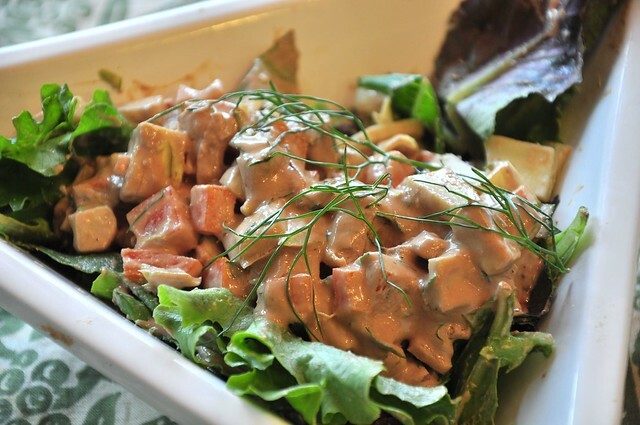 Finally, we added 1 cup of smoked cashew cream sauce (recipe, skipping the horseradish) and heated through. 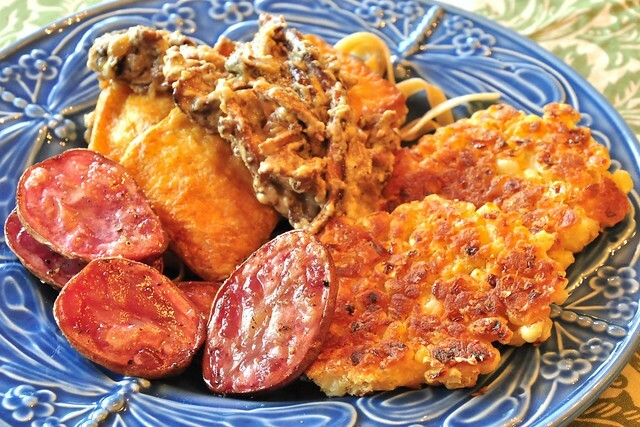 The sauce was plated on top of the hickory-smoked tofu, along with the corn cakes and roasted red potatoes. The corn cakes (recipe) started with great organic corn, in this case from the Haymaker Farmers' Market in Kent, OH via Heron Hill Farm in Brimfield, OH. It's the first place I stop every Saturday morning at 8:55am. 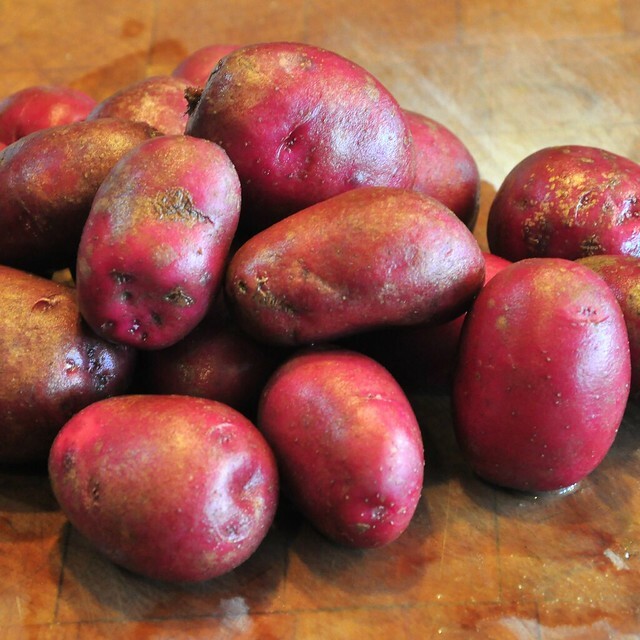 The second place I stop is the Birdsong Farm stand (from Hiram, OH), this week we picked up these outstanding red potatoes (and they really were red on the inside as you can tell in the first picture). They were split in half and tossed with olive oil, salt and pepper and roasted at 425F for 40-45 minutes. 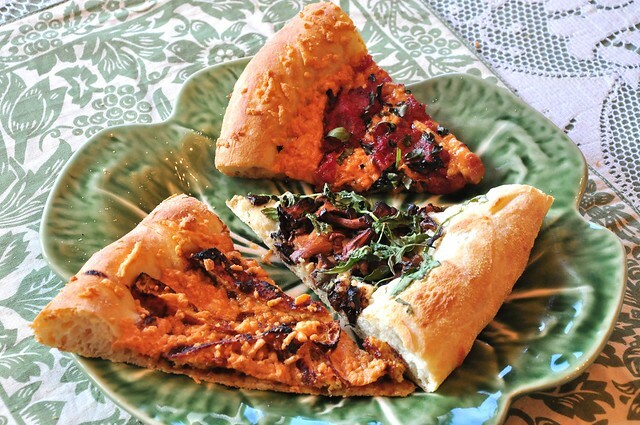 We made three smaller pizzas tonight, all with different sauces -- at the top of the picture is Tomato & Daiya, to the right of that is Chanterelle Mushroom & Arugula with a Smoked Cashew Cream Sauce (recipe, minus the horseradish) and the final one is BBQ Tofu (recipe) for our daughter. Liz fermented a batch of injera over the weekend -- the short version: mix 2 cups water with 2 cups teff flour, 2 tsp. yeast, a pinch of cumin and fenugreek and 1 tbs. agave and let sit in a warm place for 12-24 hrs., then add 1 tsp. salt. We cooked the injera in our big carbon steel wok (which is naturally non-stick) using the flat part in the center like we do for crepes. The stew was a hodgepodge (as opposed to a zackaroni) -- Liz started with 1 tbs. of olive oil over med-high heat and 1 medium red onion, diced. After the onions got a little color, she added 3 cloves of minced garlic, 2 tsp. of berbere, 1 tsp. of smoked paprika, 1 tsp. of sea salt, 1/2 tsp. fresh cracked black pepper and cooked it for one additional minute. While she was doing that, I had three other pans going, starting with 2 cups of diced kabocha squash -- pan-fried in olive oil for 5-7 minutes which was stirred constantly so the squash won't scorch. In the second pan was 2 cups of thinly sliced okra, and in the third pan was 2 cups of thinly sliced collard greens. Once all of those had cooked down (about 10-15 minutes total), I added them to the onion mixture along with a 28oz. can of fire-roasted tomatoes (we like to crush them with a potato masher) and brought to a good simmer. Finally we stirred in 2 tbs. of peanut butter. The whole thing cooked for at least 15-20 minutes until the stew thickened. 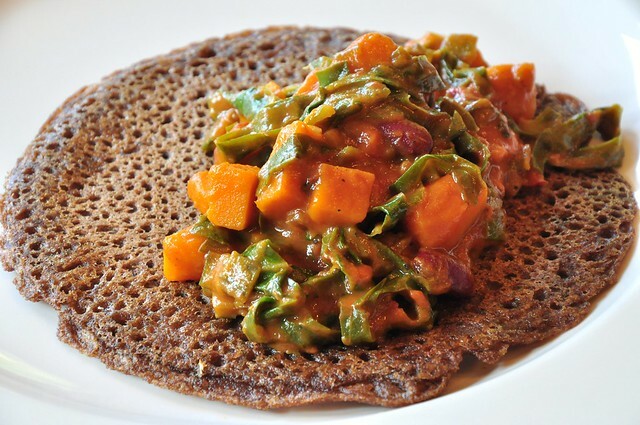 We served it hot with the injera, tearing pieces off and using it to scoop up the stew. The wild asparagus also came locally -- this was marinated the usual way -- olive oil, pepper, tamari -- and then grilled. 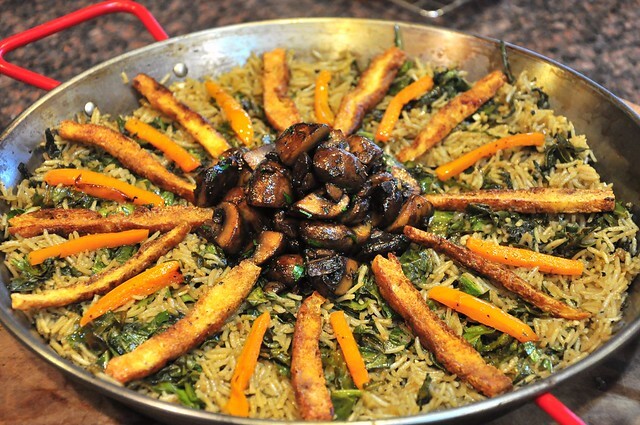 Paella (recipe) is one of my favorite meals, and one of the joys of making it is that it's different everytime. The base of olive oil, shallot, garlic, smoked paprika, saffron, salt and pepper stayed the same, but tonight's spin on the classic included button mushrooms cooked with garlic and deglazed with sherry, smoked tofu cut into strips, sauteed collard greens (garlic, tamari) and orange bell pepper.